The game time was changed because of Hoop Hall Classic which has elite high schools out in Springfield ,Ma to play. They have held the tourney there last few years. A few games will be on tv. I know I saw a few last year. You think Springfield College would have worked it out in advance. maybe put them on road this weekend. Well, regardless of the game time, MIT came to play tonight. MIT fought foul trouble to shellac Springfield tonight 89-64, handing Springfield its worst home loss of the season (second worse loss overall, they lost to Amherst by 27). MIT lead at the half 55-35. Jimmy Bartolotta picked up his 4th foul 3 minutes into the 2nd half (he had 30 points on 10 - 14 FGs, 5-7 3s, at that point in 23 minutes) and MIT was able to manage the lead without him in the game. Bartolotta ended with 33 points in 27 minutes. Billy Johnson had an exceptional game with 22 points, Jamie Karraker had 13 points, and Brad Gampel did a great job leading the team with 12 assists. FYI, the Springfield game summary says Jimmy B was the NEWMAC POY last year, which is false. Although he has been the best player in the league for 3 years now, Antoine Coleman won the POY last year because he was the second best player (Marois was better) on the best team in the conference. (Springfield should change the first line of its article from "Jimmy Bartolotta, the reigning NEWMAC Player of the Year" to "Jimmy Bartolotta, the reigning best player in the NEWMAC"). This is the 3rd game in a row MIT has made 13 3s in a game (39/75 from 3 as a team in that span). MIT improves to 4-0 in the NEWMAC (12-4 overall). I greatly respect your opinion and your insights into MIT basketball, but I would have to disagree with the idea that JB has been the been the best player in the conference for the prev. 3 years. Last year, yes, he should have been the POY. No question he got robbed on that one. But the year before, when the Josten winner comes from your conference, very hard to say that someone else in the conference was the best player. And as a Freshmen, he was not even the best player on his own team. I would agree that in 07-08 and most likely in 08-09, he is the best player in the conference, but not 05-06 & 06-07. Did anyone see the WPI-Clark game this past Saturday? I'm looking for another take on the game. I didn't get to it, but a friend (Clark Supporter) said it was a very poorly officated game. He said Coach Phillips was going crazy, and ended up getting 2 T's and tossed from the game. He did also confirm to me what I had thought all along from what little I had seen of WPI, they are vunerable to good low post play. He told me Clark did have success inside, but had a few key turnovers that killed a couple of their big rallies. That and going 4-19 from beyond the arc hurt them badly. I was curious if anyone else saw this game and what people thoughts are on the upcoming WPI-MIT matchup next week. Of course both teams have to be careful not to look to far ahead, WPI has Babson & Wheaton to play first and MIT must deal with Clark on the road. When I said last 3 years, I meant his sophomore, junior and senior seasons (so not including his freshman year when Dauria was a senior and was the New-England Player of the Year). The Jostens is an award given to the best student-athlete, it is not purely a basketball award and is almost always given to a senior (I think Bartolotta has to be on the short list of favorites for that award this year, considering he was a finalist last year). That year (his sophomore season), Bartolotta averaged 21.2 ppg, 8.7 rpg, 4.3 apg, 1.9 spg, 1.0 bpg. Compare that to Ryan Cain's 19.5 ppg, 3.8 rpg, 2.7 apg, 1.2 spg, and .2 bpg, and I think my argument that Bartolotta was the best basketball player in the NEWMAC that year is justified. With that said, WPI was clearly the better team that year, so obviously that factors into any award, team or individual, but if you are just comparing the two players, I think Bartolotta was better. For example, in their 3 head-to-head meetings that year, when they likely would have been matched up against eachother, Cain averaged 7.3 ppg (38% FG), 2.7 rpg, 2.3 apg, and 1.0 spg in 32 minutes per game, while Bartolotta averaged 15.3 ppg (46% FG), 10.7 rpg, 3 apg, and 2.7 spg in 35 minutes per game. WPI won all of those games, but the two played comparable minutes, so make of it what you will, but I think saying Bartolotta was the best player in the conference that year is not unjustified. I guess a better question is would those numbers have been reversed somewhat if they players switched teams? My guess would be possibly yes but most likely not in the rebounding numbers. 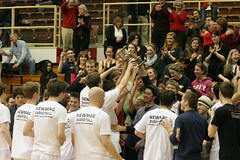 Do you know what the actual vote from the coaches was for the POY for 06-07 in the NEWMAC ? just getting my lunch, but i was looking at info about the josten's, and it seems t me it is the D3 basketball equivalent of the the Hiesman trophy, the Hobey Baker award, etc.....And is given to the best player as voted by the selection committe. Granted, these other things (Academic, Comunity Service) are factors, as they are in the Hobey Baker, but it is the generally accepted award for the best player. Like the Heisman , im sure there are always debates over who is nominated and who is left off. I mean, lets face it, the heisman always goes to a QB/RB/WR never a dominat lineman or linebacker or defensive back. Who is the "best player" will always be a debate., but someone wins these awards, and in most of the sports, they get right most of the time. The numbers do tell a big part of the story, but not always all the story. I do feel that JB has a VERY good shot at making 2 winners of the award for the NEWMAC! From what I have heard (this is by no means official because I am not affiliated with any NEWMAC basketball program and was not during those seasons), that in both of the past two years the vote was tied 3-3 between Bartolotta and Cain/Coleman with the single dissenting vote going to Craig Johnson last year (not sure who in 06-07). As the tiebreaker, the dissenting voter was asked to choose between the two top vote getters and in each case that voter went against Bartolotta. Thats what I heard, but again I wasnt in the room or involved in any way with any NEWMAC program at those times. I also disagree with you about Cain being able to put up similar numbers if he switched positions with Bartolotta. Bartolotta has shown the ability to be both an inside and outside dominating presence and on most nights commands double or even triple teams (it is almost comical the amount of attention he sometimes gets when he drives into the lane which gets his teammates a lot of very good looks). Cain (or Coleman) never really had to deal with that type of attention in their careers, because they were on more balanced teams; therefore, it would be very hard to say how another player would have performed in those circumstances. He maybe could have put up a few more points a game, but as I pointed out, Cain didnt do very much when he was being guarded by Bartolotta (a good defender), so you never know how he would have responded if he had played against double teams the entire season. Like you said, the rebounds probably would not come up either, as well as steals, blocks (defensive stats would likely not be affected very much) and assists (Cain was in a better situation to get assists at WPI because he played on a team that shot better). This argument is pointless, however, because obviously the votes have already been tallied. I hope that this year the outcome is different. Not really. Those of us who vote on it don't have the same take as you do. Agreed. Just look at the list of past winners...not necessarily the "best" player in D3. The best case-in-point is Ryan Cain. There is no way he was the best player in d3 2 years ago. Too bad he didn't transfer to Williams after his soph year to play with his high school teammate (Snyder). Last night, Wheaton won at Clark, 75-67, moving solidly into 3rd place at 3-1 in the NEWMAC. On Saturday, WPI (4-0) visits Wheaton. Any comments about how that game might go? I have not seen WPI play this year. I havent seen either team either. MIT beat Wheaton on the road (I dont go to away games) in the first NEWMAC game of the season, since then Wheaton has not lost. WPI barely got by Babson at home last night, so this could be a pretty good game.